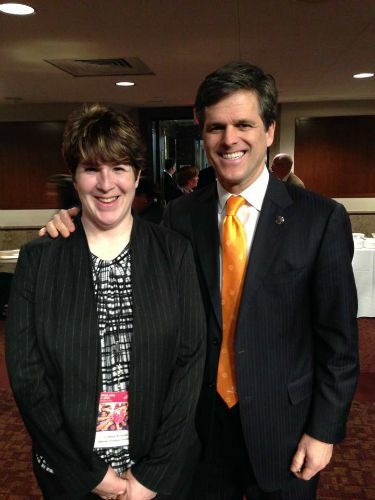 ALPS Graduate Connie Kresha is pictured with Special Olympics Chairman Tim Shriver at the 2015 Hill Day in Washington, D.C.
Special Olympics Athlete Leadership Programs (ALPS) allow athletes to explore opportunities for participation in roles previously considered “non-traditional.” Special Olympics Nebraska partners with the Gallup Organization to train and mentor athletes to become leaders in their schools and communities. In addition to leadership education, ALPS provides leadership opportunities for Special Olympic athletes — including coaching, officiating, and becoming a committee or board member. The program also focuses on public speaking through its Global Messengers curriculum, which teaches public speaking skills to athletes so that they can share their stories and opinions with others. As an integral component of Special Olympics’ dedication to empowerment and dignity, ALPS initiatives provide new opportunities for athletes and benefit the movement as a whole. For more information on the ALPS program, contact Alisa Hoffman at ahoffman@sone.org or 402.331.5545x22.